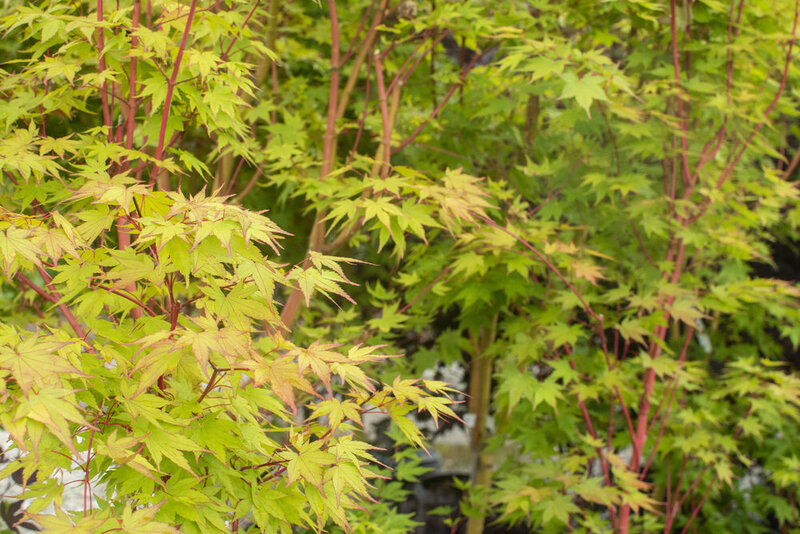 Quality Japanese Maples are now available. We stock 40 different varieties, starting in 2 gallon pots up to 20 gallons. Please call us and we can set up an appointment to view these plants. If you are interested in a list of cultivars please contact us. Upright tree which grows easily in well drained soil. Loves full sun to part shade. Known for its salmon-red bark. Leaves green in spring and summer and golden-yellow in autumn. Upright tree with bright red leaves in spring. Burgundy black in summer. Black bark provides interest in winter. Weeping form tree with crimson color leaves in summer and bright red in autumn. 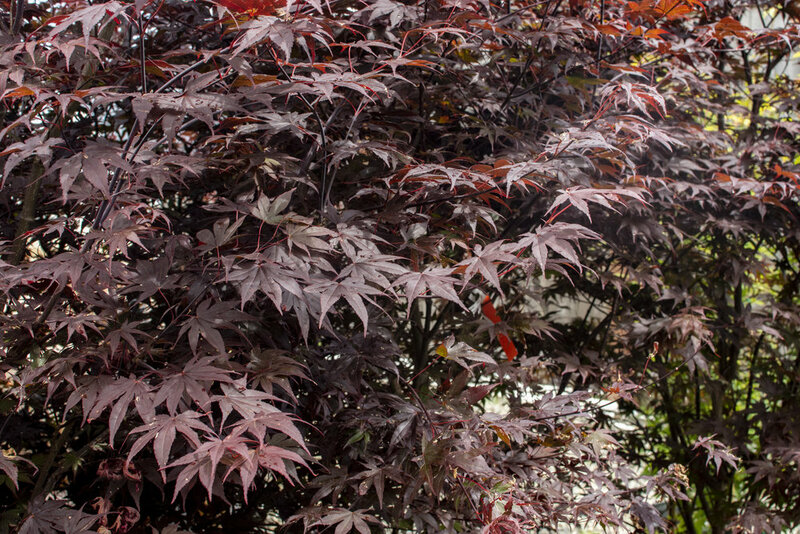 Upright maple with deep maroon leaves in summer and bright red in autumn. Upright tree with golden-yellow leaves in spring, bright green in summer and orange-yellow in autumn. 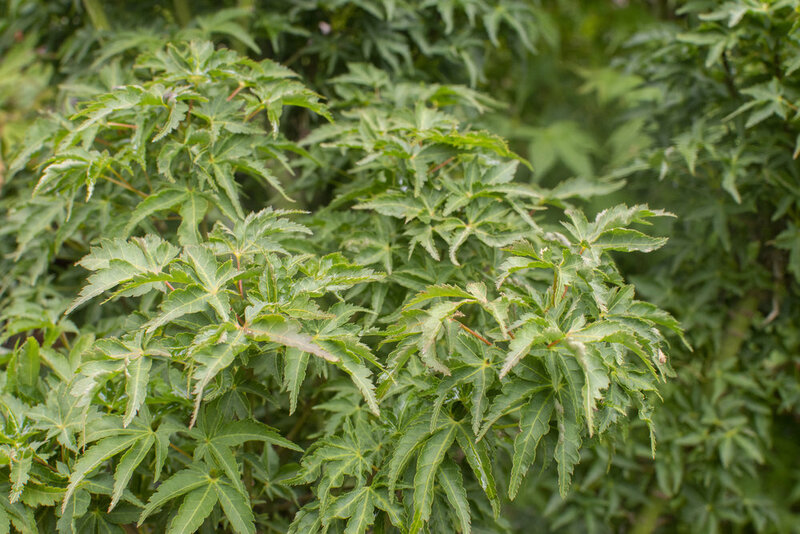 Upright shape with light green leaves in spring. Dark green in summer, turning orange, yellow, and red in autumn. Nice rounded tree with light green leaves highlighted by purple-red edging in spring, green leaves in summer, and brilliant red to orange in autumn. Shrub like tree with leaves turn purple-red with orange-red patterns in autumn. Popular for bonsai. Mounding tree with deep red bark. Leaves are purple-red in summer and bright red in autumn. Weeping tree with leaves turn gold and crimson in autumn. Loves dappled sunlight.